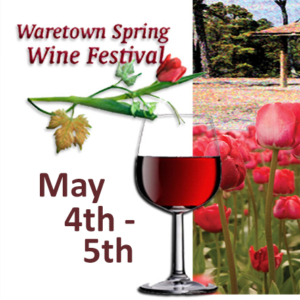 Waretown, which is located just a short distance from Long Beach Island, will host its annual Waretown Spring Wine Festival, Saturday, April 27th through Sunday, April 28th, 2019. The wine festival will be held in the Waretown Recreation and Lake Area, located at 182 Wells Mill Road. On Saturday, April 27th, through Sunday, April 28th, festival goers can look forward to sampling wines from a nice variety of award-winning Garden State wineries. In addition to wine tastings, there will also be live entertainment, as well as crafters, retail vendors, food vendors, and a children’s play area. The festival will be held each day from 12 p.m. noon to 5 p.m. ET., rain or shine.